Owens Corning and the Concrete Preservation Institute (CPI) today announced an agreement through which Owens Corning and its Foundation will support CPI's Career Skills Program at Pearl Harbor. This program will restore the historic Battleship Row mooring quays, while helping U.S. Army personnel transition to civilian jobs. "CPI's Career Skills Program gives us a great opportunity to help the men and women of our military transition to civilian life," said Don Rettig, president, Owens Corning Foundation. "Starting this relationship and work with CPI on National Pearl Harbor Remembrance Day makes it especially meaningful to our employees." "Launching the program this year, the 75 th anniversary of the Pearl Harbor attack, highlights the importance of honoring the past while inspiring the future," said Dr. Tanya Wattenburg Komas, founding director, president, and CEO, CPI. "With the generous support of Owens Corning, we are honored to help preserve this important national monument while contributing to meaningful veteran employment that addresses a national workforce development need for skilled trades and management in all areas of construction, including repair of infrastructure." CPI's Career Skills Program is the first overseas program to be approved by the U.S. Army and the only one focused on concrete. Service members from any military branch can participate in the Pearl Harbor program at no cost due to program partnerships, donations, and grants. 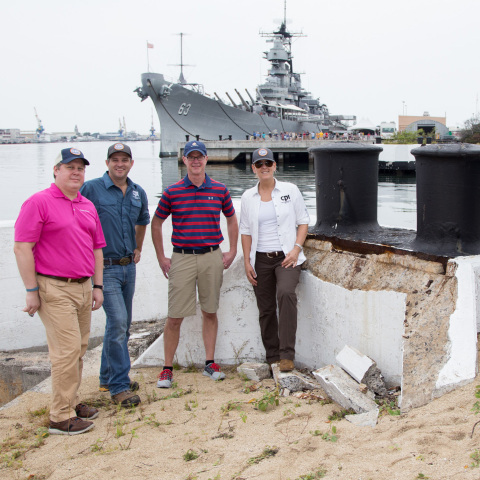 Active-duty service members will participate in CPI's three yearly, 12-week sessions for the Battleship Row mooring quay restoration project. They will learn hands-on about concrete, construction, and historic preservation while helping preserve one of the country's most important historical sites. "In our Composites business, we're committed to developing solutions to help reinforce our future, which involves both preserving national treasures and improving the integrity of future structures," added Teresa May, vice president of strategic marketing, Composite Solutions Business, Owens Corning. Owens Corning sponsored the graduation of the first cohort to complete CPI's Career Skills Program at World War II Valor in the Pacific National Monument on December 5. CPI will work with the National Park Service and other stakeholders to determine the proper preservation approach and then contribute its expertise in concrete repair and material systems. When appropriate, this may include the use of advanced reinforcing materials within the concrete system to ensure durability. CPI is a non-profit educational foundation with Field School locations at Alcatraz Island and Pearl Harbor. CPI is a partner of the U.S. National Park Service and an official Career Skills Program for the U.S. military. The Institute is supported by industry sponsorships, charitable donations, and partnerships to fund the training program and preserve structures that might not otherwise be preserved due to declining federal capital improvement budgets. CPI directors are internationally recognized experts in concrete repair and preservation. They teach in the Field School program, contribute to advancement of the repair industry through development of repair technology and approaches, engage in ongoing special projects around the world, and offer industry professional development. For more information, please visit www.cpi-foundation.org/.